The first film in fourteen years since My Neighbors the Yamadas, legendary STUDIO GHIBLI co-founder Isao Takahata revisits Japan’s famous folktale, wrote the script, and directed this gorgeous film. The hand-drawn masterwork was decades in the making. Based on the ancient Japanese folk tale “The Tale of the Bamboo Cutter”, the story explores an unaddressed angle by revealing the state of mind of its protagonist. 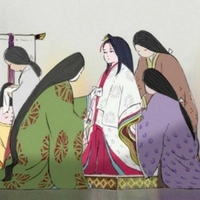 Born from a bamboo shoot, Princess Kaguya is lovingly raised by an old bamboo cutter and his wife, and becomes a beautiful young woman. What leads her to turn away suitor after suitor and return to the moon? And what was her sin, and how was she punished? Join us for the screening to find out! Sadly, this month on April 5, 2018, the revered director Isao Takahata, passed away at age 82.